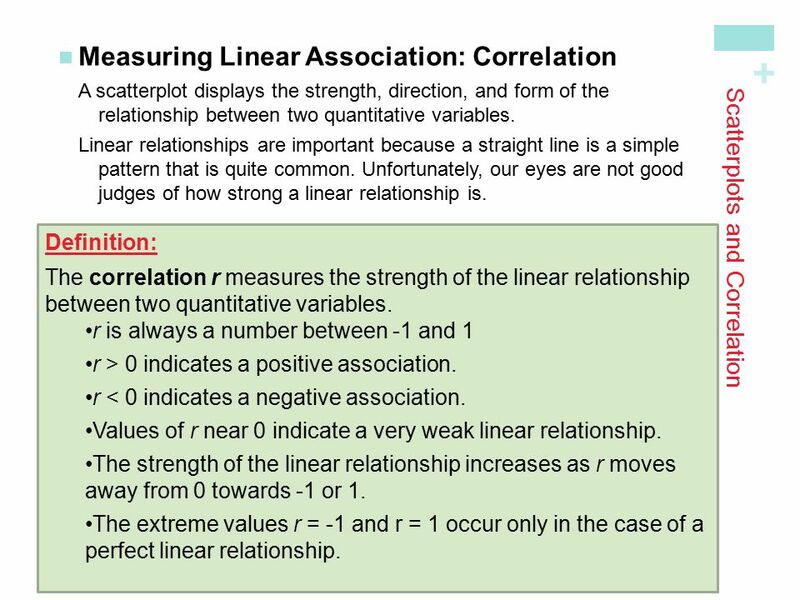 Measuring Linear Association: Correlation A scatterplot displays the strength, direction, and form of the relationship between two quantitative variables. Linear relationships are important because a straight line is a simple pattern that is quite common. Unfortunately, our eyes are not good judges of how strong a linear relationship is. 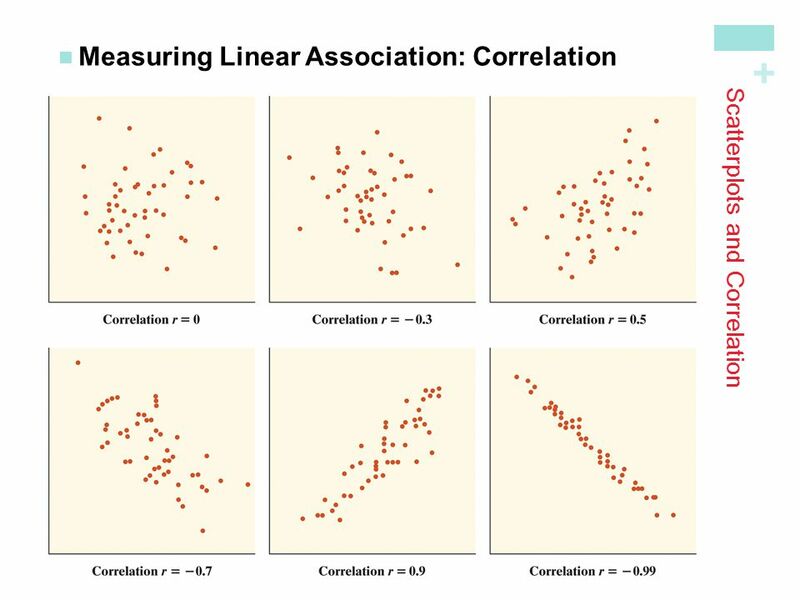 Scatterplots and Correlation Definition: The correlation r measures the strength of the linear relationship between two quantitative variables. r is always a number between -1 and 1 r > 0 indicates a positive association. r < 0 indicates a negative association. Values of r near 0 indicate a very weak linear relationship. The strength of the linear relationship increases as r moves away from 0 towards -1 or 1. The extreme values r = -1 and r = 1 occur only in the case of a perfect linear relationship. 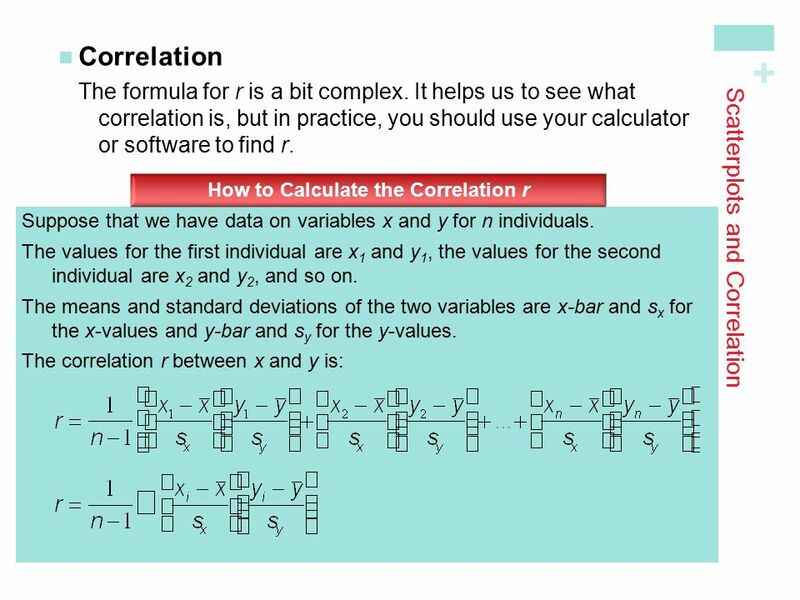 Facts about Correlation How correlation behaves is more important than the details of the formula. Here are some important facts about r. Scatterplots and Correlation Correlation makes no distinction between explanatory and response variables. r does not change when we change the units of measurement of x, y, or both. The correlation r itself has no unit of measurement. Cautions: Correlation requires that both variables be quantitative. 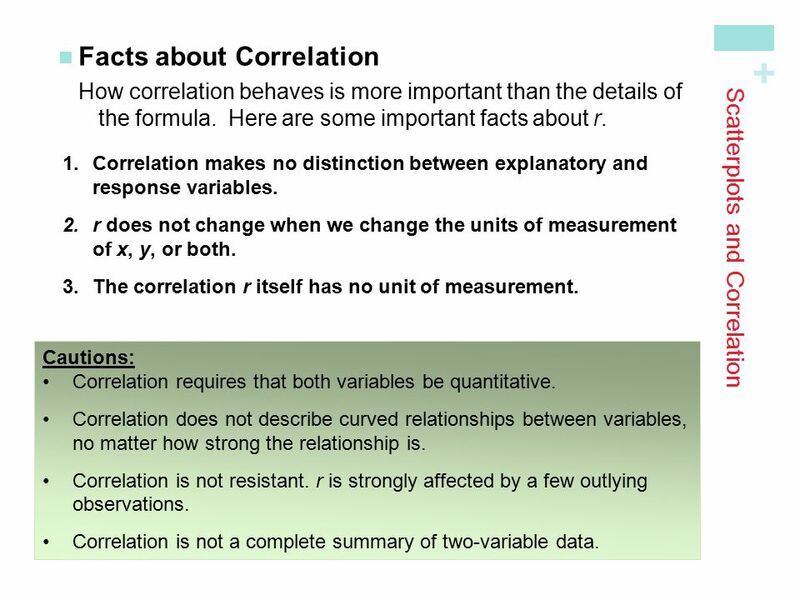 Correlation does not describe curved relationships between variables, no matter how strong the relationship is. Correlation is not resistant. r is strongly affected by a few outlying observations. Correlation is not a complete summary of two-variable data. Summary In this section, we learned that… A scatterplot displays the relationship between two quantitative variables. An explanatory variable may help explain, predict, or cause changes in a response variable. 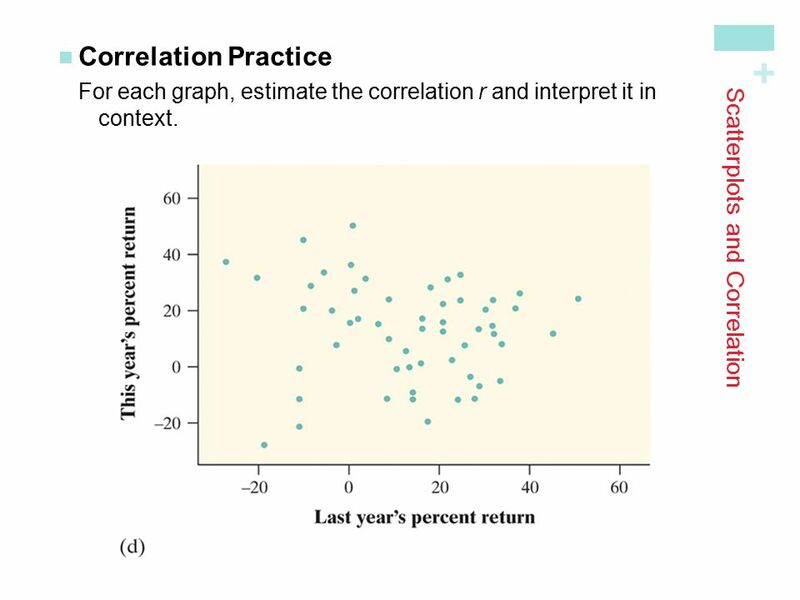 When examining a scatterplot, look for an overall pattern showing the direction, form, and strength of the relationship and then look for outliers or other departures from the pattern. The correlation r measures the strength and direction of the linear relationship between two quantitative variables. 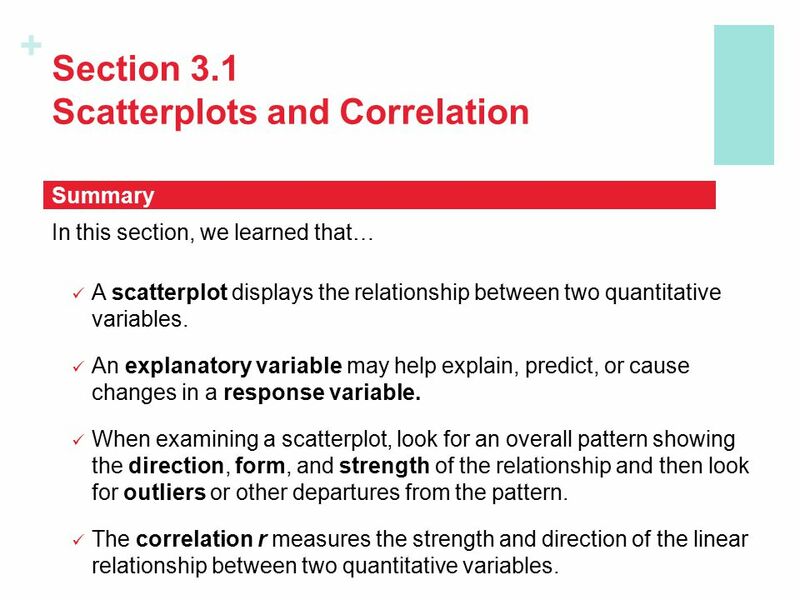 Download ppt "Scatterplots and Correlation"
Chapter 3 Examining Relationships Lindsey Van Cleave AP Statistics September 24, 2006. 3.1b Correlation Target Goal: I can determine the strength of a distribution using the correlation. D2 h.w: p 160 – 14 – 18, 21, 26. EXAMINING RELATIONSHIPS Section 3.2 Correlation. Recall from yesterday…  A scatterplot displays form, direction, and strength of the relationship between. CHAPTER 4: Scatterplots and Correlation. Chapter 4 Concepts 2  Explanatory and Response Variables  Displaying Relationships: Scatterplots  Interpreting. Looking at Data-Relationships 2.1 –Scatter plots. RESEARCH STATISTICS Jobayer Hossain Larry Holmes, Jr November 6, 2008 Examining Relationship of Variables. CHAPTER 3.1 AP STAT By Chris Raiola Emily Passalaqua Lauren Kelly. Copyright © 2010, 2007, 2004 Pearson Education, Inc. All Rights Reserved Section 10-3 Regression. 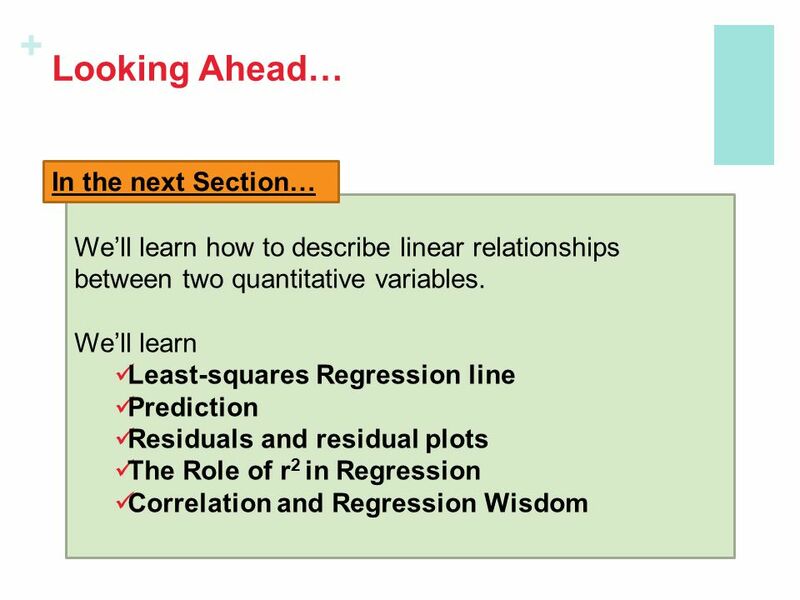 Chapter 6: Exploring Data: Relationships Chi-Kwong Li Displaying Relationships: Scatterplots Regression Lines Correlation Least-Squares Regression Interpreting.